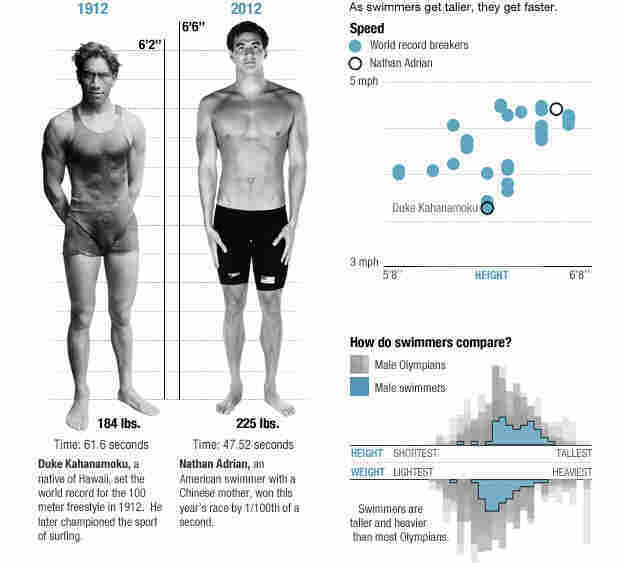 Olympic Bodies: They Just Don't Make Them Like They Used To : Shots - Health News We've put together an infographic that explores how athletes' bodies have changed over the last century. Those physiques are shaped by years of training — and by the laws of physics. The Olympic Games seem to celebrate the extremes of athletic physique — from tiny gymnasts to impossibly huge shot-putters. But why are they shaped that way? 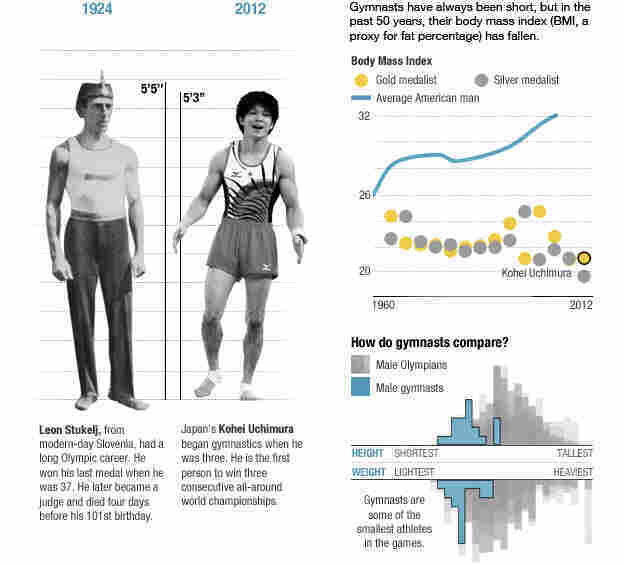 We've put together an infographic that explores how athletes' bodies have changed over the last century, and the role physics plays in each event. Here on Shots, we're taking a look at some of the athletes featured in the graphic. 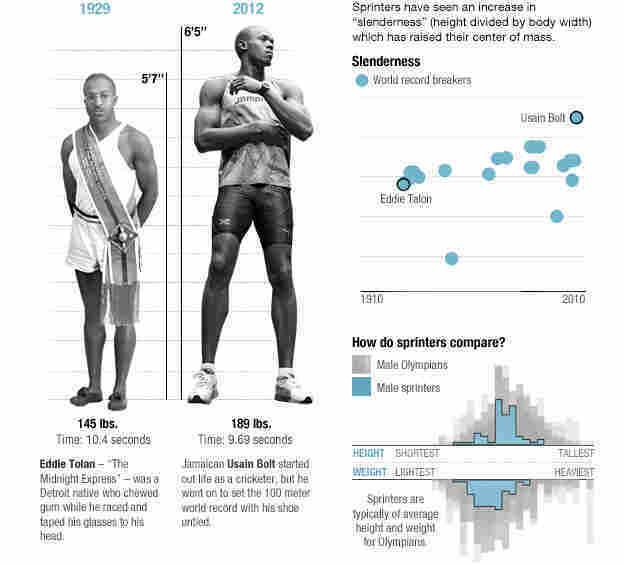 For decades, sprinters have been getting taller, propelled upward by a simple law of physics. Sprinting is basically a controlled forward fall. Runners with higher centers of gravity can fall forward faster — and the taller you are, the higher your center of gravity. Athletes of West African descent have a center of gravity that is 3 percent higher than Europeans, and they tend to dominate sprinting events. The biggest problem for marathon runners is body heat. Having a small, thin body helps maximize heat dissipation. 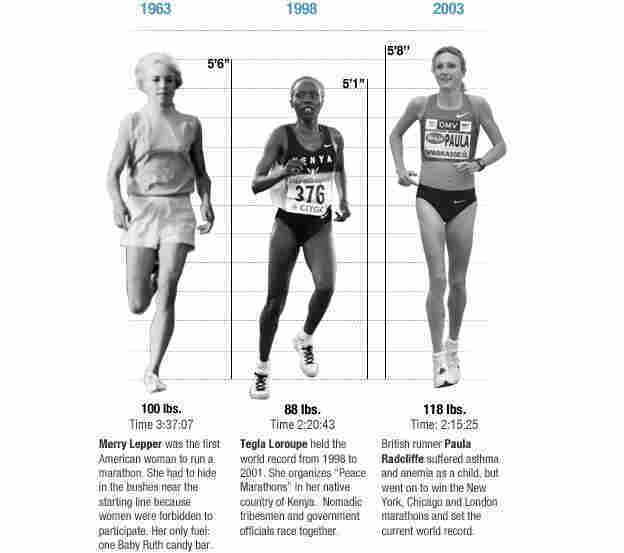 While some distance runners are shorter and some are taller, all are extremely light. Weightlifters come in all sizes, but they tend to have one thing in common: short legs and short arms. Because of their shorter limbs, they don't have to lift their barbells quite so high, so they expend less energy. 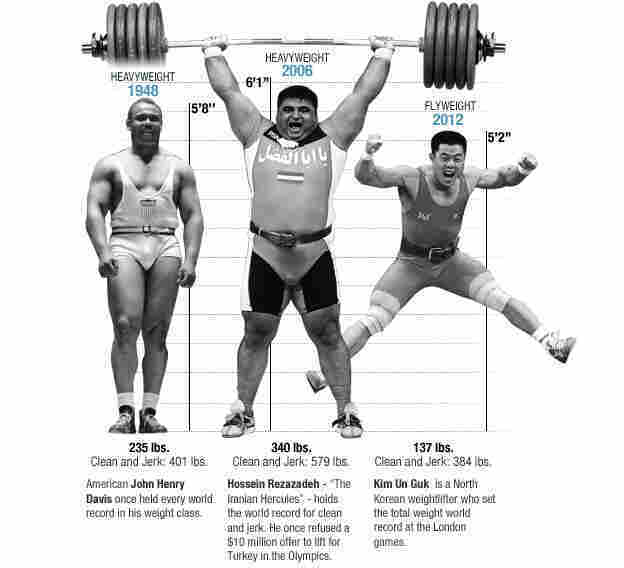 Bantamweight champions can lift three times their body weight — heavyweights, less than two. Rowing favors tall athletes who can take long, powerful strokes for efficient sculling. The ideal swimmer's physique: short, powerful legs, a huge wingspan, large hands and feet and a long, tapered torso. Asians have the longest torsos relative to their body size, but they tend to be shorter, so swimming has long been dominated by Europeans. If you are going to be twisting and turning rapidly through the air, it helps if there is less of you to turn. That's one reason gymnasts are so small. 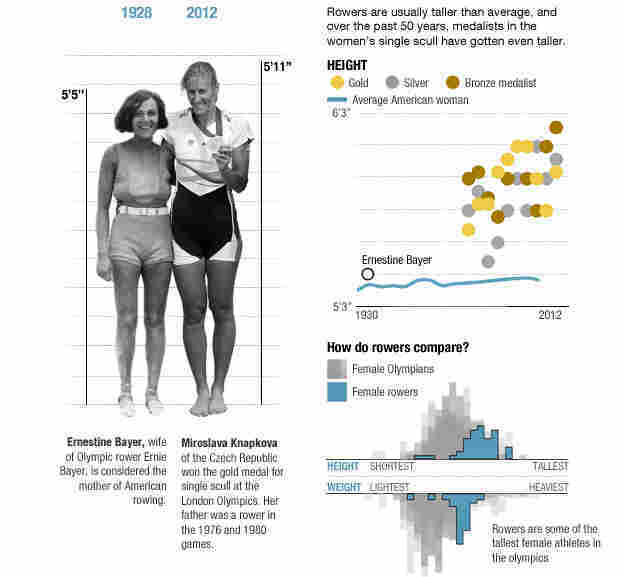 They have some of the lowest body fat percentages in sports, and the body mass index of gold medalists has been declining for the past 50 years. There are a lot more details about the physics behind Olympic physiques in the full infographic, so be sure to check it out.